Space debris is an ever growing environmental problem occurring in space. After over 50 years of space rocket launches, our near space is littered with approximately 10^6 objects larger than 1 cm in diameter, weighing a total of 5500 tons (Nasa ODQN Jan 2010). As the atmosphere is very thin in near-Earth space, these objects do not come down very quickly, causing danger to Earth orbiting spacecraft for tens or hundreds of years to come. Once these objects are in space, there is also a probability that these objects will eventually collide with each other and create even more debris. As the probability of in flight collisions increases as a function of debris in orbit, a catastrophic collisional cascade process that renders regions of near-Earth space unusable is a real risk. This scenario is often referred to as the Kessler syndrome. A video of the evolution of space objects is shown below. 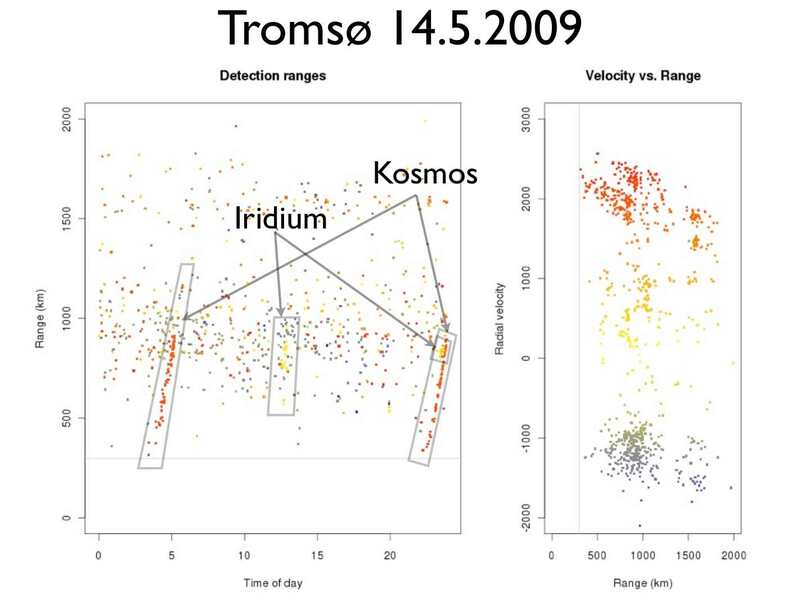 EISCAT has been active in space debris measurements for over 10 years, producing hundreds of hours of space debris measurements, covering two major break ups: the Chinese anti-satellite collision and the collision of the Iridium and Cosmos satellites. 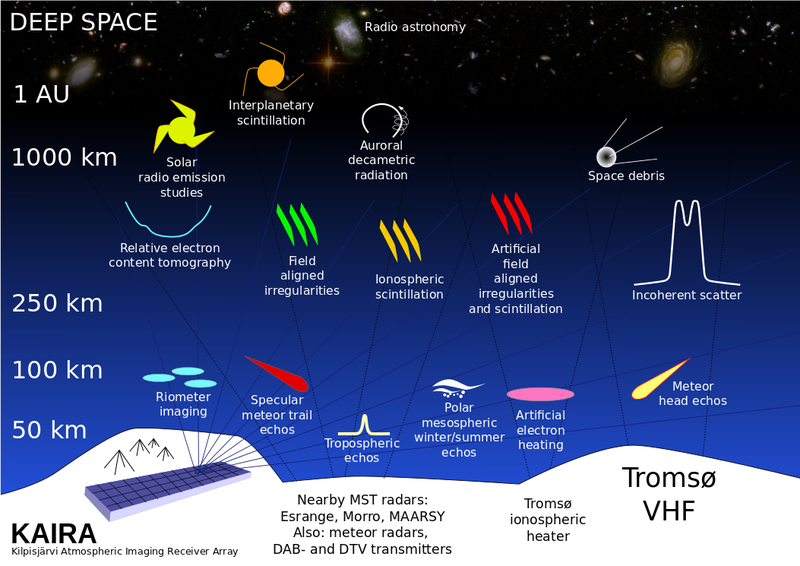 Most of the measurements are so called beam-park measurements where the antenna is positioned at a fixed pointing. During a 24-hour period, while the Earth rotates around its axis, a representative statistical sample of debris is measured, containing information on orbital elements of the debris. The time of day provides information on the longitude of the ascending node, while the Doppler shift gives information on the inclination of the object. 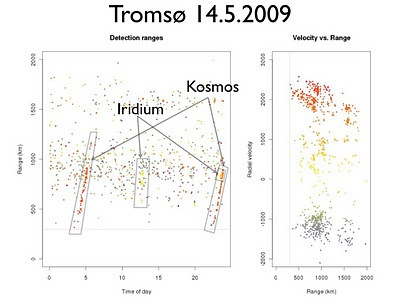 An example measurement produced after the collision of the Iridium and Cosmos satellites is shown in the figure below. 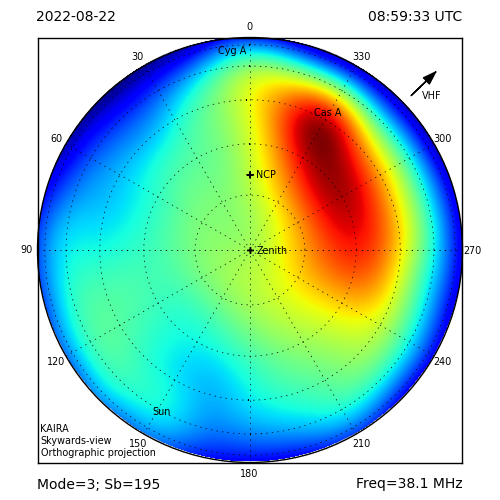 the radar beam, the color represents radial Doppler shift. full sized version. One of the potential uses of the planned EISCAT3D system is to track space objects and space debris. One of the advantages of a phased array system is the capability of observing a large volume of space simultaneously and making interferometric direction angle measurements. This will allow accurate trajectory measurements that can be used for collision avoidance with operational spacecraft, such as the International Space Station or Envisat. For more information on EISCAT space debris activities can be obtained here.